According to Ben Volin of the Boston Globe, New England Patriots quarterback Tom Brady has thrown Dwayne Allen a “ton” of targets in the red zone during training camp practices. 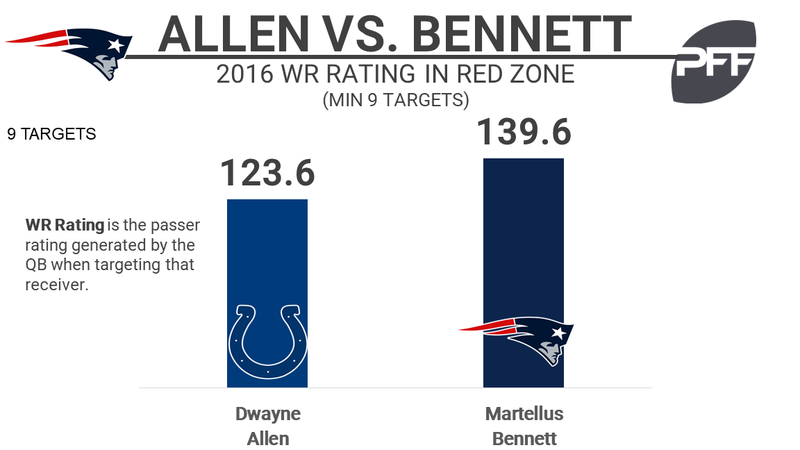 The Patriots have always prioritized the tight end position and acquired Allen in a trade with the Colts upon the departure of tight end Martellus Bennett. Last year Allen was very efficient in the red zone. Quarterbacks had a passer rating of 123.6 when targeting him as he caught six of his nine targets including four going for scores. The opportunity for continued production should be there considering that in 2016, the Patriots tight ends accounted for 24.2% of 66 red zone targets with the recently departed Martellus Bennett getting 10 of those targets. Allen has always graded better as a receiver than as a blocker. Outside of one season (2015), Allen has graded average or above (70.0 overall to 80.0+) as a receiver in every season of his career. This past year Allen ranked 42nd out of 62 qualifying tight ends with an overall grade of 49.0 but ranked 25th among tight ends in receiving grade (71.4).